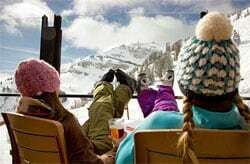 I have to confess that I have never been skiing or snowboarding before so it may seem a little strange that I am writing an article recommending the best skiing binoculars to you! But someone who does ski a lot wrote to me and they were extremely helpful in that they were very specific about what features are required, so it is just down to me to highlight these features and if possible find the binoculars that have all or as many as possible of the required features in order to find the best binoculars for skiing and snow boarding. A good pair of binoculars will come in very handy especially if you ski off-piste: Before going down it is preferable, even important to "scout" the downhill terrain to determine an optimal path to go down and identify possible dangers ahead. Also for navigation you need to look around. Even if you use topographic maps, aerial photos and have a local guide, the snow will vary every day, and as such you have to use your eyes (an binoculars) as well. To enjoy the mountain views, see some wildlife and see other skiers! The binoculars need to be carried with you when skiing, but often during climbing as well. On top of this most people will probably be flying to their skiing holiday and as such it is obviously preferable to have a binocular that is not only lightweight but compact enough to easily pack into your luggage and ski pack. The obvious choice would be a full compact binocular, but I would also suggest looking at mid-sized binoculars that should still be still small enough, but have the added advantage that they will be much easier to use with thick gloves on. It is inevitable, especially with thick gloves on that you will drop your binoculars in the snow or in a pool of melting water. There may also be times that you use them in poor weather conditions so it only makes sense that your binoculars are waterproof. This feature is more important to skiers than just about anywhere else as cold air + warm breath + glass = fog! Fogging up of your optics often also occurs when you get rapid changes in conditions. The temperature in the backpack can easily drop to -20°C (-4° F), but when used in the sun it might be up to 10°C (50° F). On top of this once you get back to your cozy log cabin, your optics will go from very cold conditions to very warm ones in a short period of time. You will fall when skiing and often at high speed. On top of this because you will often be wearing thick gloves when using your optics, the possibility of dropping them is higher. A tough pair of optics with rubber armour is thus preferable. The binoculars should be easy to operate with thick gloves on. Look for glasses that have large focusing rings, this is especially relevant if you decide on a compact binocular as opposed to a mid-sized binocular. Binoculars like the Minox 8x33 BL (see below under my recommendations) that have an open bridge design will also be much easier to hold onto with gloves on. Whilst on good days there are not many places on earth where the lighting is better than on top of a snow clad mountain. But when the weather goes bad, it can get very bad and mountains can "white out" and so they should be able to perform well in poor light conditions. The best performing binoculars in poor light conditions will be ones with large objective lenses, which makes the binocular large and bulky, something that we have already decided is not desirable. Small binoculars that have high quality prisms, lenses and lens coatings will outperform ones with larger objective lenses with inferior optics. So as a compromise I would recommend choosing compact binoculars that have as good a quality optics as you can afford. Binoculars should at least have BAK-4 prisms and be "Fully Multi-Coated", which means that all air to glass surfaces have received multiple layers of antireflection coatings that will assist light transmission. What will also help with image brightness is not choosing a binocular that has a huge magnification. The higher the magnification, generally the less bright the image is produced by the optics. See below. A good contrast is also essential to asses the terrain. Again high quality optics will help. As a sign of quality look out for binoculars that advertise that they are "Fully Multi-Coated" and not just "Fully Coated" or "Multi-Coated". Not common except on the very best roof prism compacts are Phase Correction coatings on the prism glass that keeps light in correct color phases will enhance resolution, contrast, and color fidelity. I am not sure if you would use the binoculars primarily with or without your sunglasses, but it might be the easiest to be able to keep them on and so a pair of binoculars with a good amount of eye relief could be useful. In most cases an eye relief of 14 to 15mm is needed for the average eyeglass wearer to be comfortable. Ideally though you should look for binoculars that have 16, 17 or even 18mm. Below is an email I recieved from Ken Blackman regarding using binoculars in snowy conditions and the glare off the snow - as he has far more experience than me in these conditions, I would take his advice and look for a pair that has plenty of eye-relief so that you can use them with your glasses on. I am not sutre how much eye-relief you would need for goggles - can anyone help? I read your report on skiing with binoculars with great interest as I have been skiing for the past 30 years, there is one aspect of your report that you basically floated over but which is vitally important and that is using Binos using sunglasses, you did mention that you may or maynot use binoculars with sunglasses? I would say never use them on snow without sunglasses, goggles? or filters, a lot of damage could be done to your eyes if you looked through binoculars at sun drenched white snow, just looking at snow without binoculars that is reflecting the sun is bad, everyone who skis wears either sunglasses or goggles because of the risk of snow blindness, I would put it in the same categary as looking into the sun, have you tried using binoculars with goggles? is it possible as the eye relief with goggles is immense? I feel you should edit your report with this danger in mind. Whilst it is always tempting to get the highest magnification possible, this is not always desirable. High powered magnifications make it much harder to keep the image that you are looking at through your optics still and generally the higher the magnification, the less bright the view will be through your optics. Another down side to a high magnifications is that it usually results in a narrower field of view. A good wide field of view is always better when using your optics to scan large areas. I would recommend sticking to around 8x - 10x magnifications for skiing binoculars. A wide field of view will make it much easier to scan the terrain. Not massively important in this context, but if you have a choice between two binoculars that are very similar, go for the ones with a wider field of view. Shape: Having something with sharp edges in your backpack can not only be annoying, but dangerous if you were to fall on it, so look for a binocular that has nice smooth rounded edges. Look for binoculars that either have lens covers that are tethered to the body of your optics or as most one so are attachable to your neck strap - this will prevent you from either loosing them. So to sum up we are looking for lightweight, tough, compact or mid size binoculars that are fog and waterproof. They should have good to excellent quality optics with a magnification of around 8x to 10x and be easy to use with thick gloves on! The open bridge design will make them easier to handle, especially with thick gloves on and the focusing ring is also large enough to make it easily accessible. They also feature tethered objective lense covers that will protect your optics in your bag and you won't loose them in the snow when taking them off to use. These are fully waterproof to a depth of up to five meters. They have also been "nitrogen purged", which means that the air inside the binocular has been replaced with nitrogen gas, this prevents the interior optical surfaces from fogging up due to rapid temperature changes or in areas that have high humidity. This 8x33 Minox has fully Multi-coated Lenses which means that ALL the air to glass surfaces on the lenses and prisms are multilayer-coated with anti-reflective coatings. What this does is help increase light transmission across the entire field of view. Bak-4 roof prisms are used meaning they are made of superior optical glass that produces clearer images. As well as this the prisms also have a Phase-correction coating that help to reduce the phase shift of light caused by phase differences arising from total light reflection on a roof surface! Sounds complicated, but basically it keeps the light in correct color phase and has the result of reducing the loss of image resolution to maintain high-contrast images. It is a feature that is only found on high end roof prism binoculars and is what we are looking for in the best skiing binoculars. There is an excellent 17.5mm of eye relief which easily makes it into the category of a long eye relief binocular. These are "High Quality" optics and as such they cost between $300 - $500 (£300 - £500). This is way below the very top of the range binoculars like the Nikon 8x32 EDG and Swarovski 10x32 EL's which means that for me they may excellent value for money. Think of it this way, the Nikon EDG's are about double the cost of these, whilst the Swarovski's are almost 4x the cost. But are they 2x or 4x better? No way! Read full Review - Read my full review of these binoculars. 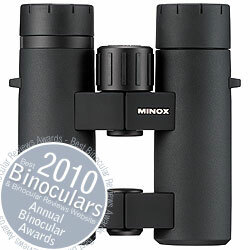 If the price of the Minox 8x33 BL above is a little too steep, take a look at either the Nikon 10x36 Monarch ATB DCF Binoculars or the Barr & Stroud 8x32 Sierra Binoculars below.